Make any engine run better and last longer with fuel filters from FloTool™. Keep the debris out. Use on any engine. Make any engine run better and last longer with fuel filters from FloTool™. Removes water. Keep the debris out. Flow Rate - 2.5 Gallons per minute. MPN: RFF8C. Manufacturer PN:RFF8C. Manufacturer PN : RFF8C. Fuel Filter Funnel. 5.0 GMP, 127 Micron. Boat Accessories: Deck-Cabin. Boat Inboard I/O Engine Parts. Boat Outboard Engine Parts. 2 Quart capacity. No delays here. We want you to have the parts as bad as you do. Compatible with VP FUEL CONTAINERS - 3091. Compatible with VP FUEL CONTAINERS - 3082. Filters Gasoline, Diesel, Heating Oil, and Kerosene. REMOVES WATER, Dirt and Debris from Fuel. Item Model NumberAF8CB. 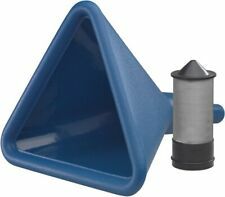 Marine Stainless Steel Boat 3-Stage Fuel Filter Funnel. 15" x 8"x 7"
Works with Gas, Diesel, Heating oil and Kerosene. 3.5 gallons per minute. Color: Black.